An 84-year-old Japanese women presented to our institute due to abnormal chest computed tomography (CT) findings showing a 45 × 40 × 40-mm tumor located in the anterior mediastinum. This tumor was composed of cystic and solid lesions. The patient had no remarkable medical history. Laboratory tests showed no abnormal findings but an elevated serum carcinoembryonic antigen (CEA) level, and abdominal CT also showed no abnormal findings. The mediastinum tumor was suspected to be malignant based on the CT findings and elevated CEA level; however, a definite pathological diagnosis for the tumor could not be made before the surgery. 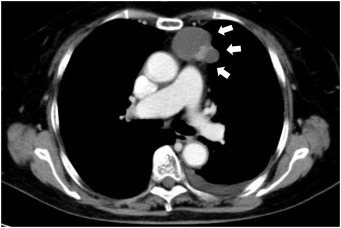 The tumor was resected local completely via VATS through the left thoracic approach. In the left thoracic cavity, a few small nodules were found. We resected these nodules. We confirmed local dissemination of thymic papillary adenocarcinoma with permanent specimen. This patient discharged healthy from our institute at six days post-operation. Pathologically, the tumor consisted of two separate components. 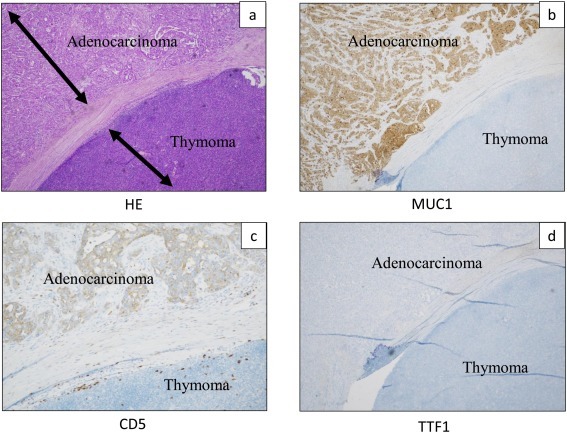 These two microscopically separate tumors were diagnosed as a thymic papillary adenocarcinoma and a type A thymoma (Masaoka stage I). The first tumor consisted of poorly differentiated papillary adenocarcinoma. There was no evidence of mucin production, nor were there any Hassal’s corpuscles around the tumor, but it was continuous with the thymic tissue. Immunohistochemical (IHC) staining was positive for MUC1, EMA, CD5, p63 and bcl-2 but negative for TTF-1, calretinin and thrombomodulin. The MIB-1 index was 70%. The second tumor was type A thymoma. This tumor consisted primarily of spindle-shaped epithelial cells and many lymphocytes without atypia.